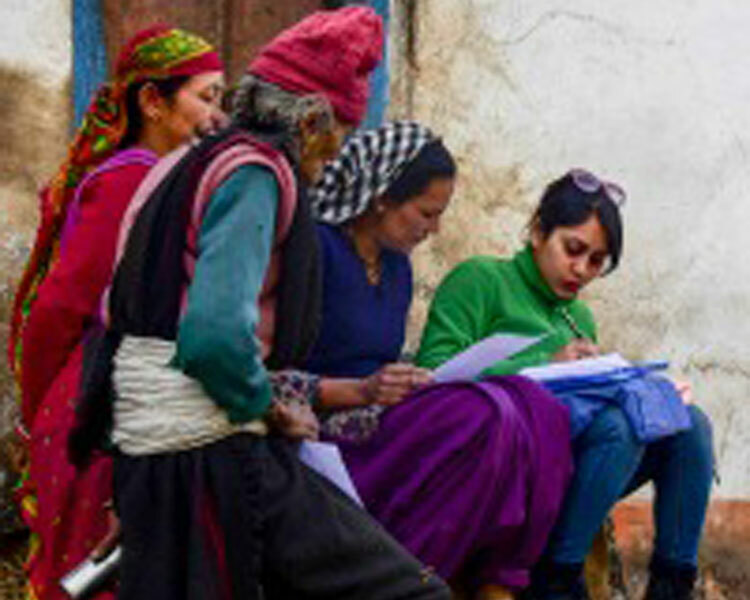 D-Lab research associate Megha Hegde (right) conducting a focus group discussion with women in a village in the Kapkot block of Bageshwar district. I was in Uttarakhand between January 6 and 31st to oversee a team conducting an assessment to understand current needs related to drinking water and usage of water filters. Findings of this study will be used to determine the design criteria for the xylem filter as part of a current research project, "Development of Low-Cost Water Filter Using Sapwood Xylem," with MIT principal investigators Rohit Karnik, Associate Professor of Mechanical Engineering and Amy Smith, Senior Lecturer, Department of Mechanical Engineering and Founding Director, D-Lab. This trip represented my first experience as a D-Lab trip leader and I couldn't have asked for a better team. I travelled with two students: Nupur Dokras, a second year student at MIT Sloan School of Management and Caroline Morris, a Wellesley junior taking D-Lab classes. We partnered with a local NGO called People’s Science Institute (PSI) for on the ground support to implement research activities. (Because Rohit and team had previously done some research in the region and had established contacts, setting up the project in the region was that much easier.) We also hired three graduate students from Uttarakhand: Chandra, Vikram, and Deepak, to help us with translation and coordination. In addition to Amy and Rohit, our technology team members at MIT include Krithika Ramchander, PhD candidate and Tata Fellow; Luda Wang; post-doctoral fellow; and Kendra Leith, Evaluation Manager at D-Lab. 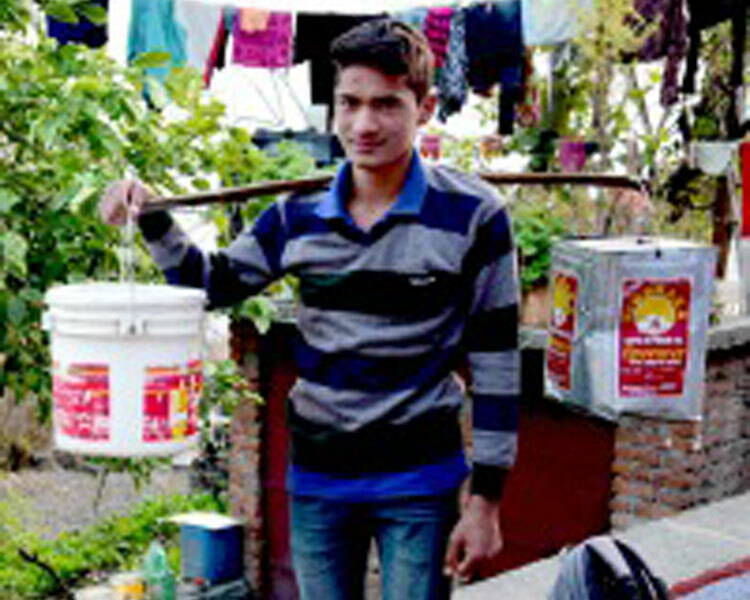 We conducted our work in two districts in Uttarakhand, Almora, and Bageshwar. In Almora we focused on the town and in Bageshwar about seven villages. Both districts are in the foothills of Himalayas, in high altitudes. We decided to do this study in Uttarakhand, because the coniferous trees are plentiful in the region and the literature suggests that there is high level of bacterial contamination in drinking water in the mountainous regions, especially in the monsoon season. While spellbindingly beautiful, it was extremely cold! Freezing temperatures, zero indoor heating and limited hot water made our lives a bit difficult in the beginning. All three of us got sick in the first week and almost thought that we would not be able to finish the work. But we recovered and got used to the cold and everything went almost as planned. Our work include nterviews, focus groups, immersion and design workshops. We interviewed a total of 269 households, and several other stakeholders such as doctors, filter vendors and NGO staff, conducted five focus group discussions, two design workshops and few immersion activities. This gave us a very good understanding of the things on the ground. We have a great deal of data that we are currently anazlyzing. I conducted my first design workshop in this trip and it was a great experience! We did two of them in two different villages. In the first workshop, more than 15 women participated, and made filter prototypes with the materials we provided. It was amazing to see the level of creativity in the women with no or very little formal education. They were too shy to even say their names out loud in the beginning, but as the workshop progressed, they opened up and finally came up with some great filter prototypes. My team and I had a lot of fun and learned so much. The second workshop did not go as well, women in that village did not completely trust us and were not ready to spend a lot of time with us. I think it was because the local contact was a man and did not have good rapport with the women. More than 10 women participated in the workshop, but they did not take us seriously or listened to us. They did not want to wait to make filter prototypes and left early. While leaving they literally fought us and took most of the supplies such as scissors, duck tapes and so on. While it was a bit disappointing, it was a great learning too. We learned how important it is to have a good local contact who has good relationship with people and who can bring people together. In the first village, that was the case. The local contact was a very dynamic young woman who knew everyone in the village, women trusted her, and so she was able to bring them together which resulted in a great workshop. We found that most people in Uttarakhand depend on natural spring for drinking water. In towns and cities, we saw quite a bit of filter usage, but in the villages the use of filters or any water treatment method was almost nil. Though a few people have filters at home, they don’t use them regularly. From talking to so many people, it was very clear that, their mindset about spring water was the biggest reason for low adoption of water treatment methods. Affordability was the 2nd biggest reason. It’s a common belief that spring water is the purest form of water that does not need any treatment or filtration. While that was true several decades ago, increase in human and livestock population in the recent years is leading to contamination of spring water. The doctors we interviewed reported that water borne diseases are on the rise, more in children and especially in monsoon season. But they also mentioned that some adults might have developed some level of immunity to those diseases. Our partner NGO PSI has conducted water testing in several parts of Uttarakhand, and they reported that spring water both in towns and villages have shown bacterial contamination and is not recommended to drink without treatment. While it’s clear that there is a great potential for Rohit’s low-cost filter, it also means that people’s mindset about spring water would be the biggest hurdle for adoption. Hence, we have to find creative ways to motivate behavior change while also getting the filter design and price right. The next phase of our work includes data entry and analysis, internal presentation and reporting, and an exploration of opportunities to do a similar study in a different area. Uttarakhand was mesmerizing. We saw the great Himalayas and explored some very interesting places. All places we visited were in the mountains, not much connectivity to roads. So we did a lot of hiking everyday. People were very nice and welcoming as usual. Both American and Indian students got along very well, which made the work effective and enjoyable. Overall the trip was a success; we learned a lot and had a lot of fun. Caroline, Nupur, and the Indian students worked very hard to get things done. We were a great team! 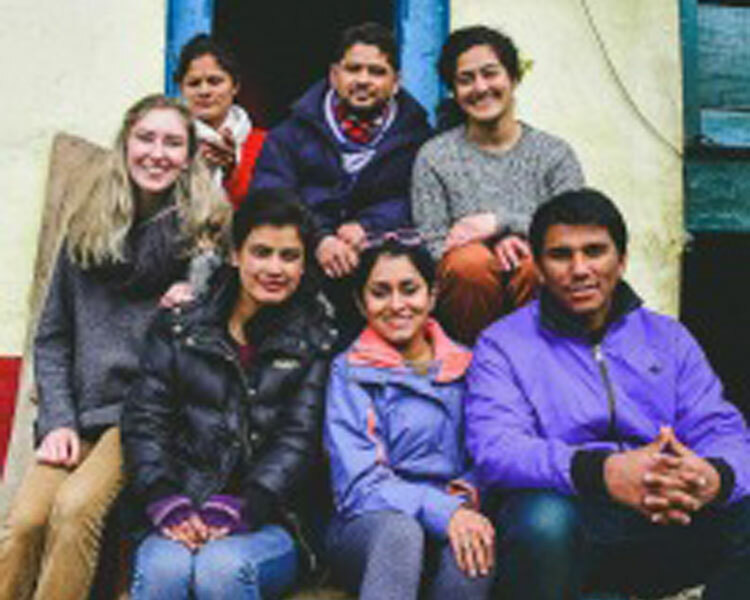 The MIT D-Lab team and local university student translators. 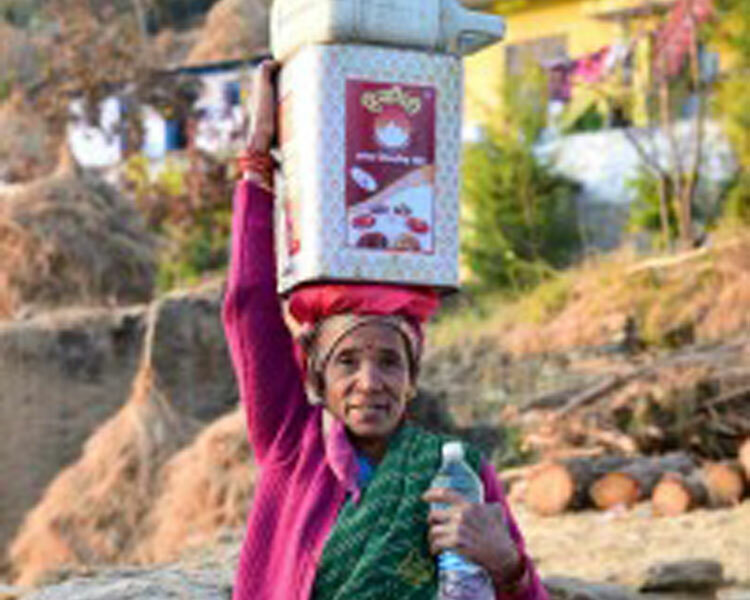 A woman carrying drinking water collected at a natural spring on her head. Megha Hegde conducting interviews with women in a village. A young man carrying water collected at a natural spring. 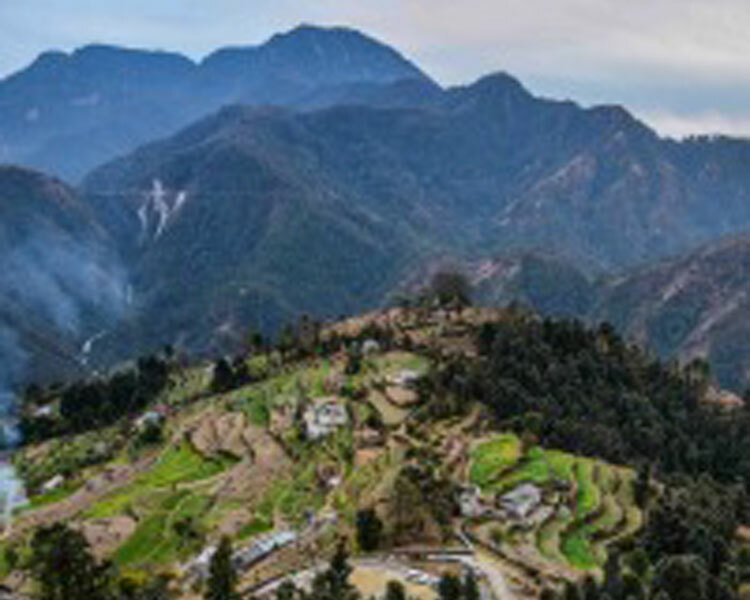 View of a mountainous village in Bageshwar district where the team was doing research.